By now we’re well aware that Léa Seydoux is affiliated with Louis Vuitton. She’s always decked out in the iconic French fashion house’s clothing and starred in the brand’s Spirit of Travel advertising campaign for Spring 2016. Therefore, it should come as no surprise that the French actress was LV’s choice to star as the face of its newly unveiled perfume collection. 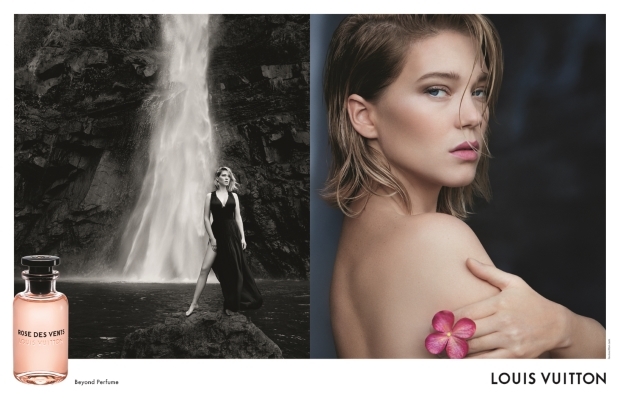 Photographed by Patrick Demarchelier, Léa smolders in the hypnotic images, as the team traveled to South Africa and shot on location at Lone Creek Falls, which makes for a captivating campaign backdrop. However, the campaign left our forum members with mixed feelings. “The picture is really beautiful and Léa looks so good but if I saw it alone, I would’ve never of guessed it was for Louis Vuitton. They need more coherence between their multiple lines. Anyway, I’m happy that it’s Léa and not Selena Gomez (such a weird ambassador for LV),” pivoslyakova pointed out. “Love Lea and seeing her in ads and she looks lovely, but I think I would like the image more if her lips and the flower were closer color-wise to the bottle color. That fuchsia really jars for me,” said rox_yr_sox. “I don’t like the lip color but otherwise great ad!” sixtdaily wrote. “Looks like Demarchelier’s Pirelli calendar, which is old,” shared a disapproving Pricciao. Lola701 defiantly wasn’t impressed. “I really don’t like it. I expected something similar to Hermes perfume ads, the Balenciaga/Gainsbourg perfume ad or even Louis Vuitton’s past Core Values campaigns. Something dreamy, soft and evocative without being In your face. This is too trendy and harsh. I really don’t like it,” she expressed. Are you impressed with the campaign? Sound off here.